Almond and Herb Crust Schnitzel - Wheat free, gluten free alternative to bread crumbs. This recipe has been updated and improved. 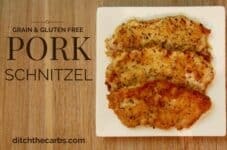 Take a look at the new and improved version of grain free and gluten free pork schnitzel. 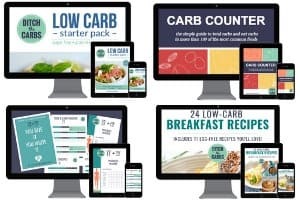 When you live a low-carb or gluten-free lifestyle, you’re always looking for ways to re-make your favorite dishes to fit your diet. Finding meals like Almond and Herb Crusted Schnitzel that are easily adapted to fit whatever healthy lifestyle you are living. 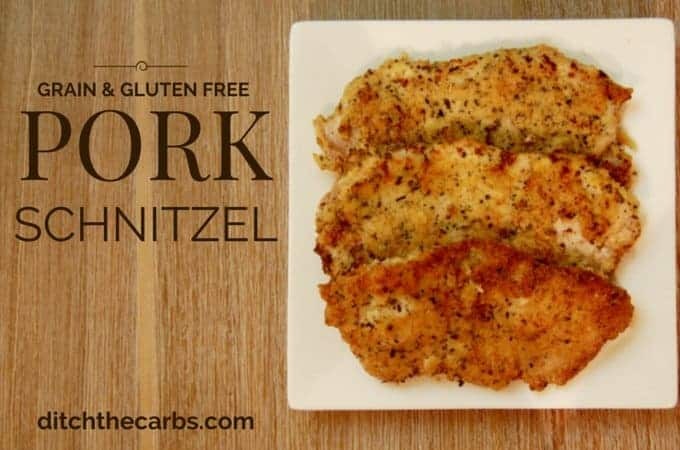 Schnitzel is an easy-to-make 15-minute meal that proves eating healthy doesn’t have to take a lot of time. Using almond meal, or ground almonds, is a great substitute for bread crumbs or flour. It coats easily, frys well and is free from wheat, grains and gluten and extremely low in carbs. Any leftover almond and herb crusted schnitzel are great for lunch boxes or chopped on a salad. Use chicken, turkey or pork schnitzel. Use the almond and herb crust for fish nibbles. This Almond and Herb Crusted Schnitzel is low-carb, wheat free, gluten free, paleo and absolutely delicious. This 15-minute meal is the perfect weeknight dinner! In a small bowl, beat eggs with a fork until fully combined. In a second small bowl, mix the almond meal, herbs, lemon zest and parmesan. Heat the frying pan on a low/medium heat and add butter so the almond, herb crust doesn't stick and to give the crust a lovely buttery flavour. Dip one piece of schnitzel at a time into the egg mixture to ensure both sides are covered. Lift to allow the excess egg mixture to drain, then place each side in the almond mixture so that it is fully coated. Place gently into the frying pan, adding more butter as they cook and absorb the butter from the pan. Cook until golden on both sides. Generally, this only takes about 2-3 minutes each side. Serve with cream cheese and more fresh herbs. Some of my older recipes are in the process of being updated. This was divine! I’m so happy with how great this schnitzel tasted I’ll definitely be making it again (and again and again!). This was delicious. I am disappointed that the nutrition information is lacking. It is a very early recipe when I just started the website. I am slowly growing back and updating them. You can always calculate for yourself by using MyFitnessPal which I always recommend anyway if accuracy is important to your plan. My nutrition panels are guides only because the food brands you choose to use in each recipe vary so widely. My daughter lives in Berlin and schnitzel is always a must. I used to make “Crumby Chicken”; a boneless breast coated with fine bread crumbs, parmesan cheese and herbs and fried. (Kind of a fancy chicken fried steak.) I had not thought of using coconut flour instead. I think then it would be called hänchen-snchitzel. I’m doing my best to cut out grains & sugar. Processed foods and soda have been out for quite awhile. (It is difficult to get the sugar out of iced tea for a good ‘old Texas boy. The ground almonds make it so tasty, especially with the herbs you decide to add to the mixture. Lemon zest and parsley would be nice or lemon zest and rosemary. Thanks for stopping by.